With the advent of the Industrial Revolution, developments in metals production and the concept of mass production were adopted in America and Europe by the late 19th century. In the early 1900's metal objects, like jewelry boxes, and other novelties, could be manufactured in quantity-far less costly to produce than the one-on items created by craftsmen previously available only to the wealthy. 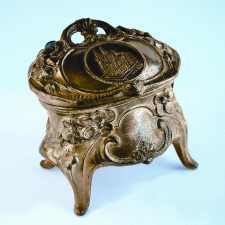 International trade between countries had brought attention to new decorative styles from all over the world. 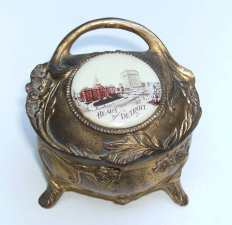 The Industrial Revolution also encouraged the development of a middle class which was now also able to purchase not just the essentials, but also to travel to points of interest and purchase decorative items. To profit from these changes in traveling, American entrepreneurs created the “Exposition”--a trade fair with the primary purpose of providing an opportunity for advertising products and exchanging scientific, cultural and industrial ideas. These Fairs were very popular tourist destinations, providing a "world view" never before imagined, and spurring an interest in and enthusiasm for collecting. Called "jewel cases", "caskets" and occasionally "trinket boxes", early jewelry boxes in the United States were primarily of the popular Art Nouveau style. They were usually cast in metals with low melting points (or "soft" metal), thus explaining the broken hinges we see on jewel cases today. 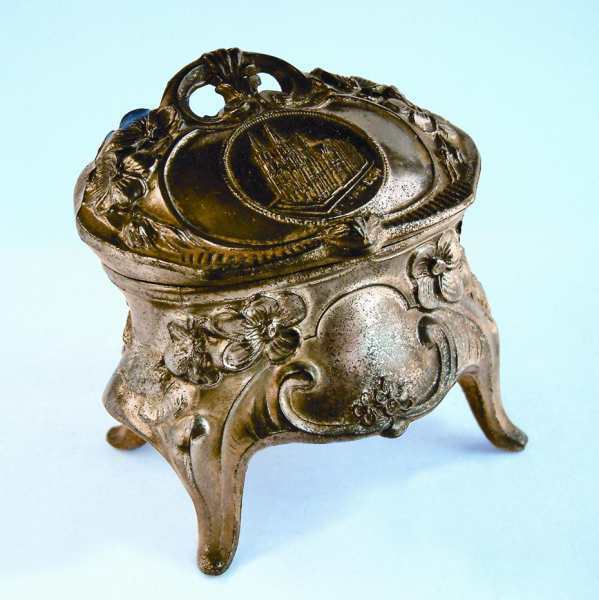 Next, the boxes were finished (electroplated) with gold, silver, or copper-a then recently discovered technique. 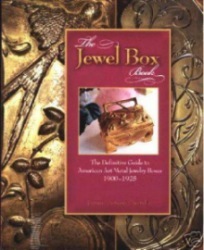 American jewel boxes were available in all sizes-from the smallest ring box to handkerchief- and even glove-size boxes! 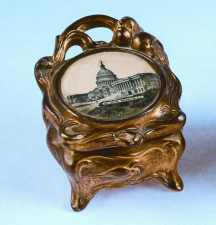 They were also quickly adapted to the "Souvenir" category--with imprints, ceramic discs, and photos atop the jewel boxes commemorating popular destinations--to capture the fancy of the American buyer. 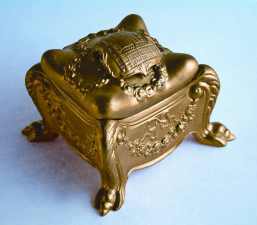 "My lady's jewel box, if chosen by herself, will quite probably give expression to some of the tastes and characteristics of its owner. It may be a richly embossed square or oblong silver casket.... 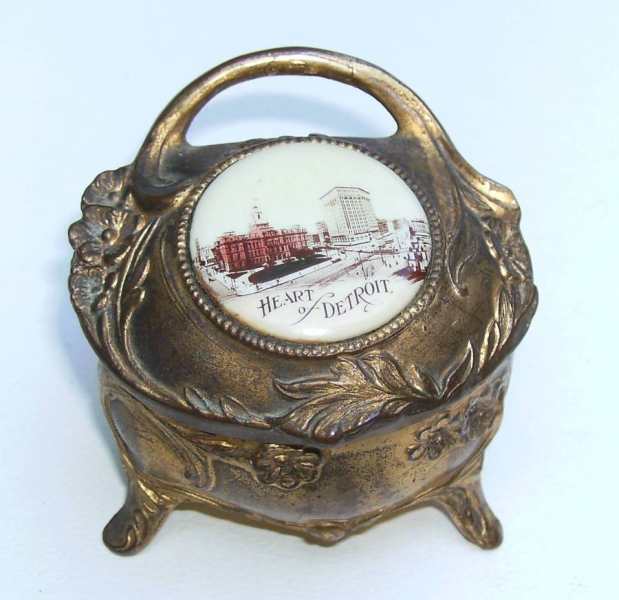 Still another style of jewel box, well established in favor, is the heart shaped affair of silver, which ranges from a considerable size down to the tiniest of ring and trinket holders.... In briefly noting the contents of an equipped jewel box there is no question of the article with which the chronicler must begin. It cannot be other than the ring, around which clusters so much of the sentiment and romance of jewelry tradition, which has never been more profusely elegantly worn in this country than today. For though modified in appearance somewhat from time to time by the vagaries of ever changing fashion, the ring yet defies them all and, with its endless round, remains essentially the same, always beloved of womankind." 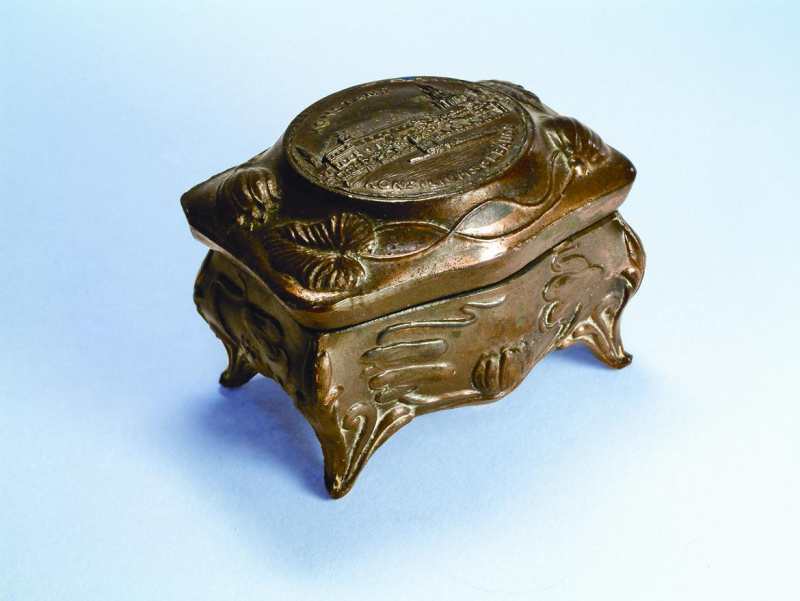 About the same time, a jewelry and kindred wares industry was fast developing in Germany and, at the end of the 19th century, Pforzheim was the primary city for their manufacture. By 1907 there were hundreds of factories employing almost half the population of the city. And by 1912, nearly 29,000 people worked in the jewelry industry. So, German manufacturers began to explore exporting opportunities in foreign countries, especially the United States. Electroplated ware was not as prominent in Germany as in the United States. It had been replaced (to a great extent) by the use of composition metals which were called "white metal", "German silver", and "nickel silver". These metals were desirable because, being cast of the same metal throughout, they retained the same appearance despite wear, and were "harder" than those used in the United States. For this reason, fewer of these German jewel boxes have broken hinges today or are otherwise damaged. German factories kept secret their exact composition. Germany's export of composition metal wares of all kinds in 1911 and 1912 was about $1.5million each year. Many souvenir jewel boxes were exported to the United States, and we still find them in the United States today. It is also interesting to note the style of German jewel boxes. Some do exhibit the Art Nouveau influence, yet the floral motifs of others are somewhat more "stiff" or "rigid" than the flowing asymmetrical lines one normally associates with Nouveau. Every locality has some good reason for self-congratulation. Some historic associations, picturesque features, old land-marks or notable edifices constitute appropriate subjects for local pride. 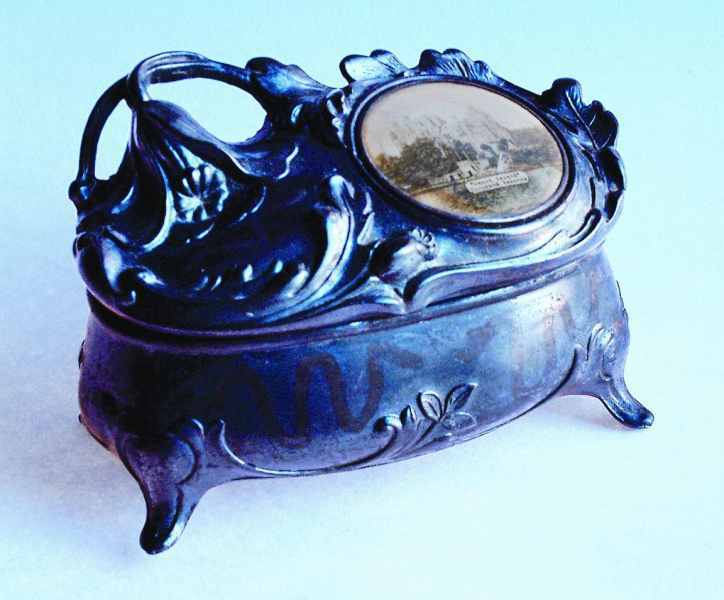 Souvenir articles representing such associations are sure to be purchased by visitors or presented by local residents to their guests.... All of our souvenirs possess the double value of being very attractive and desirable in themselves while also having the interest of a Memento." All these factors combined - increased travel and discretionary spending, a desire for beautiful items not previously available to the "average" person, and the manufacture of "objets d’art" priced as trinkets - encouraged travelers to purchase mementos of their journeys inside and outside of their country. 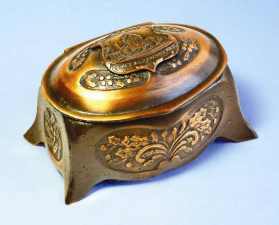 This gave rise to the Souvenir Jewelry Box, and the sale of jewelry boxes as souvenirs became a phenomenon. 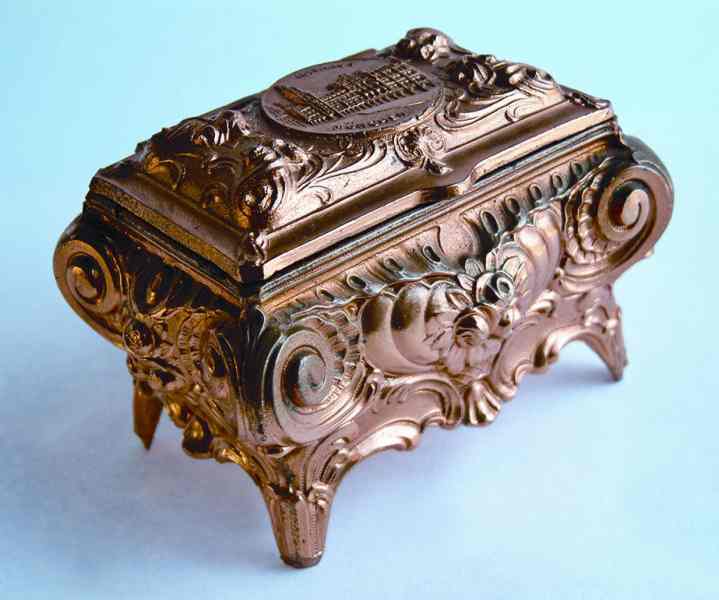 Fortunately, we can still discover and collect examples of these 100-year-old decorative treasures. 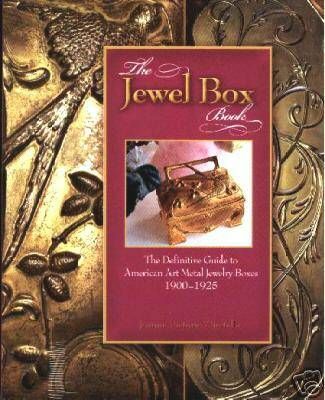 author of "The Jewel Box Book: The Definitive Guide to American Art Metal Jewelry Boxes 1900-1925"